BACKGROUND AND PURPOSE: To date, no studies have investigated the predictive validity of variables from the initial examination to identify patients with neck pain who are likely to benefit from thoracic spine thrust manipulation. The purpose of this study was to develop a clinical prediction rule (CPR) to identify patients with neck pain who are likely to experience early success from thoracic spine thrust manipulation. SUBJECTS: This was a prospective, cohort study of patients with mechanical neck pain who were referred for physical therapy. METHODS: Subjects underwent a standardized examination and then a series of thoracic spine thrust manipulation techniques. They were classified as having experienced a successful outcome at the second and third sessions based on their perceived recovery. Potential predictor variables were entered into a stepwise logistic regression model to determine the most accurate set of variables for prediction of treatment success. RESULTS: Data for 78 subjects were included in the data analysis, of which 42 had a successful outcome. A CPR with 6 variables was identified. If 3 of the 6 variables (positive likelihood ratio=5.5) were present, the chance of experiencing a successful outcome improved from 54% to 86%. DISCUSSION AND CONCLUSION: The clinical prediction rule (CPR) provides the ability to a priori identify patients with neck pain who are likely to experience early success with thoracic spine thrust manipulation. However, future studies are necessary to validate the rule. Clinical prediction rules (CPRs) consist of combinations of variables obtained from self-report measures and the historical and clinical examinations and assist with subgrouping patients into specific classifications. Recently, CPRs have been shown to be useful in classifying patients with low back pain (LBP) who are likely to benefit from a particular treatment approach. [18–20] Although a treatment-based classification system for the management of neck pain has recently been proposed,  no studies have investigated the predictive validity of variables from the initial examination to identify patients with neck pain who are likely to benefit from thoracic spine thrust manipulation. Therefore, the purpose of this study was to develop a CPR to identify patients with neck pain who are likely to benefit from thoracic spine thrust manipulation based on a reference standard of patient-reported improvement. We conducted a prospective cohort study of consecutive patients with mechanical neck pain who were referred for physical therapy at one clinical site (Rehabilitation Services, Concord, Hospital, Concord, NH). Inclusion criteria required subjects to be between the ages of 18 and 60 years, with a primary complaint of neck pain with or without unilateral upper-extremity symptoms and a baseline Neck Disability Index (NDI) score of 10% or greater. Exclusion criteria were as follows: identification of any medical “red flags” suggestive of a nonmusculoskeletal etiology of symptoms, history of a whiplash injury within 6 weeks of the examination, a diagnosis of cervical spinal stenosis, evidence of any central nervous system involvement, or signs consistent with nerve root compression (at least 2 of the following had to be diminished to be considered nerve root involvement: myotomal strength, sensation, or reflexes). All subjects reviewed and signed a consent form approved by the Institutional Review Board at Concord Hospital, Concord, NH. Four physical therapists participated in the examination and treatment of subjects in this study. All therapists underwent a standardized training regimen, which included studying a manual of standard procedures with the operational definitions and video clips demonstrating each examination and treatment procedure used in this study. All participating therapists then underwent a 1-hour training session in which they practiced the examination and treatment techniques to ensure that all study procedures were performed in a standardized fashion. Prior to participating in data collection, therapists were visually observed by the principal investigator as being able to successfully perform all examination and treatment procedures on a patient with neck pain. Participating therapists had a mean of 12.3 years (SD=10.0, range=3–23) of clinical experience. The clinician next measured cervical range of motion and symptom response  and assessed the length  and strength (force-generating capacity)  of the muscles of the upper quarter and endurance of the deep neck flexor muscles. The amount of motion and symptom response were recorded for both segmental mobility testing  of the cervical spine and spring testing33 of the cervical spine and thoracic spine (C2–T9). The physical examination culminated with a number of special tests typically performed in the examination of patients with neck pain, including the Spurling test,  Roos test,  Neck Distraction Test,  and Upper Limb Neurodynamic Test. Specific operational definitions for each test and criteria defining a positive test are presented in the Appendix. Of the 80 subjects who were enrolled in the study, 22 underwent a second examination by an additional therapist who was blind to the findings of the first clinician. The 22 subjects who underwent a second evaluation were selected based on the availability of a second clinician to perform the examination. The reliability analysis was performed to evaluate the reliability of the identified potential predictor variables. All subjects received a standardized treatment regimen, regardless of the results of the clinical examination, because treatment outcome served as the reference criterion. Each subject received 3 different thrust manipulation techniques directed at the thoracic spine during each session: a seated “distraction” manipulation, a supine upper thoracic spine manipulation, and a middle thoracic spine manipulation. The first manipulation performed was the “distraction” manipulation. The subject was seated, and the therapist placed his or her upper chest at the level of the subject’s middle thoracic spine and grasped the subject’s elbows. A high-velocity distraction thrust was performed in an upward direction (Figure 1). The upper thoracic spine manipulation was performed with the subject positioned supine and clasping his or her hands across the base of the neck. The therapist used his or her manipulative hand to stabilize the inferior vertebra of the motion segment (the therapist was instructed to target between T1 and T4 with this technique) and used his or her body to push down through the subject’s arms to perform a high-velocity, low-amplitude thrust (Figure 2). Following the manipulation techniques, all subjects were instructed in a cervical-range-of-motion (CROM) exercise (10 repetitions performed 3– 4 times daily)  (Figure 4) and were advised to maintain their usual activity within the limits of pain. The CROM exercise consisted of the subject placing his or her fingers over the manubrium and placing his or her chin on the fingers. The subject was instructed to rotate to one side as far as possible and return to neutral. This was performed alternately to both sides within pain tolerance. The first treatment session was always performed on the day of the initial examination, and the subject was scheduled for a follow-up visit within 2 to 4 days. The global rating of change (GROC) served as the reference criterion for establishing a successful outcome. The GROC is a 15-point global rating scale ranging from 7 (“a very great deal worse”) to 0 (“about the same”) to 7 (“a very great deal better”). Intermittent descriptors of worsening or improving are assigned values from 1 to 7 and 1 to 7, respectively. [41, 42] It has been reported that scores of 4 and 5 are indicative of moderate changes in patient status and scores of 6 and 7 indicate large changes in patient status. It was determined a priori that subjects who rated their perceived recovery on the GROC as “a very great deal better,” “a great deal better,” or “quite a bit better” (ie, a score of 5 or greater) at the second session were categorized as having a successful outcome, and their participation in the study was complete. A high threshold for determining a successful outcome was established to maximize the likelihood that the clinical outcome was attributable to meaningful improvements in symptoms due to the intervention as opposed to the passage of time. Subjects whose scores on the GROC did not exceed the 5 cutoff at the second session again received the thrust manipulations as in the first treatment and were scheduled for a follow-up within 2 to 4 days. At the start of the third session, subjects again completed the GROC and were judged to have a successful outcome based on the previously described criterion. If the subjects still did not meet the threshold for success, they were categorized as having a nonsuccessful outcome. At this point, their participation in the study was complete, and further treatment was administered at the discretion of their therapist. Subjects were dichotomized as having a successful outcome or as having a nonsuccessful outcome based on the treatment response, as indicated on the GROC. The mean NDI and NPRS change scores (and 95% confidence intervals [CIs]) were calculated for the both groups and analyzed using an independent t test to determine whether a difference existed between groups. Individual variables from self-report measures, the history, and the physical examination were tested for univariate relationship with the GROC reference criterion using independent-samples t tests for continuous variables and chisquare tests for categorical variables. Variables with a significance level of P<.10 were retained as potential prediction variables. This significance level was selected to increase the likelihood that no potential predictor variables would be overlooked. For continuous variables with a significant univariate relationship, sensitivity and specificity values were calculated for all possible cutoff points and then plotted as a receiver operating characteristic (ROC) curve. The point on the curve nearest the upper left-hand corner represented the value with the best diagnostic accuracy, and this point was selected as the cutoff defining a positive test. Sensitivity, specificity, and positive likelihood ratios (LRs) were calculated for potential predictor variables. Potential predictor variables were entered into a stepwise logistic regression model to determine the most accurate set of variables for prediction of treatment success. A significance level of .10 was required for removal from the equation to minimize the likelihood of excluding potentially helpful variables. 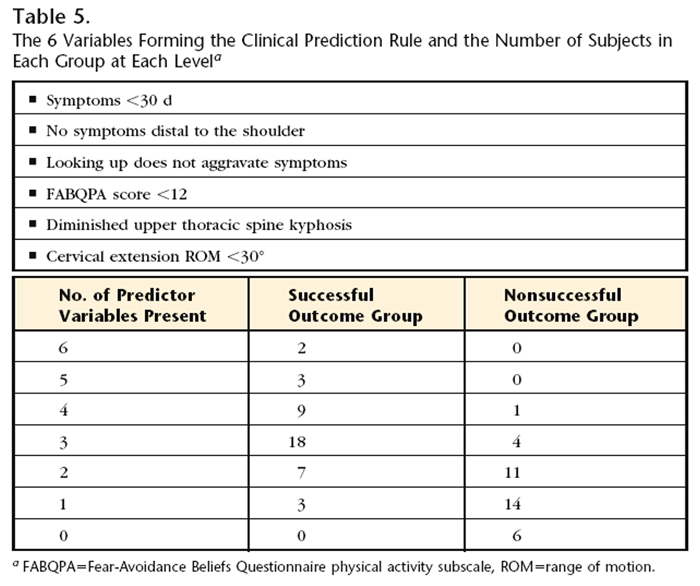 Variables retained in the regression model were obtained as the CPR for classifying patients with neck pain who are likely to benefit from thoracic spine thrust manipulation, exercise, and patient education for this sample of subjects. We further analyzed the data to determine whether weighting individual predictors according to the relative size of the beta coefficients increases the prognostic accuracy of the model. Weights were calculated by taking the beta coefficient for each variable in the final model and dividing it by the lowest beta coefficient and then rounding to the nearest integer. Once the weight was formulated, an ROC curve was used to identify the cutoff value that represented the best diagnostic accuracy for the pointbased system. Sensitivity, specificity, and positive LRs as well as corresponding 95% confidence intervals were calculated for the cutoff point that maximized the diagnostic utility of the weighting system. Therapists were characterized by years of experience to determine the effect of experience on patient outcomes. Therapists were dichotomized as having 3 or fewer years of experience or more than 3 years of experience. Only one treating clinician had less than 3 years of experience. The percentage of successful outcomes for each group (≤3 years of experience or >3 years of experience) was calculated and compared using a chi-square test of independence. The NDI change scores also were calculated and were compared between groups using independent t tests. Between March 2004 and September 2005, 80 subjects were recruited for the study. The total number of subjects screened, reasons for ineligibility, and dropouts are shown in Figure 5. Two subjects failed to return for the second treatment session, and their data were excluded from the analysis. Subject demographics and initial baseline variables from the patient history and self-report measures for the entire sample as well as for the successful outcome and nonsuccessful outcome groups are presented in Table 1. 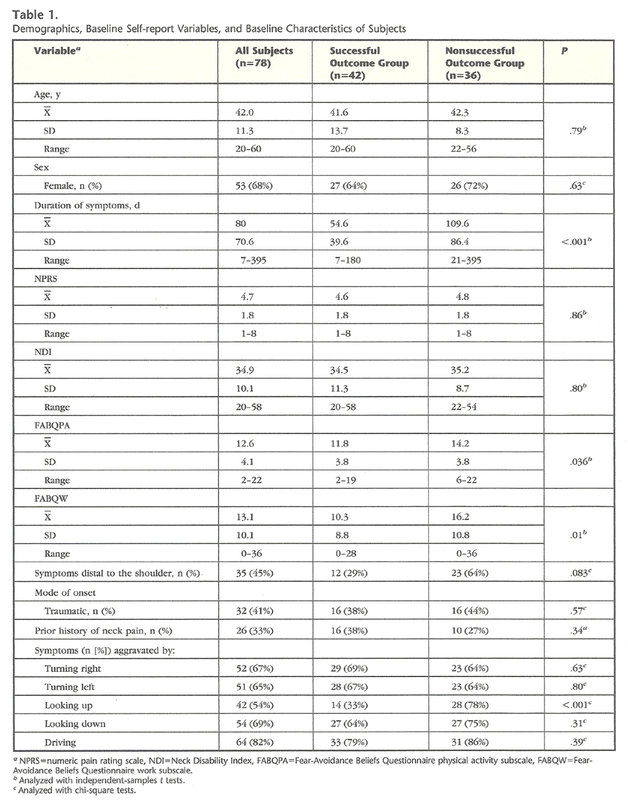 Baseline clinical examination variables for the entire sample and for the successful outcome and nonsuccessful outcome groups are shown in Table 2 for categorical data and in Table 3 for continuous data. Forty-two subjects were categorized as having achieved a successful outcome, and 36 subjects were categorized as having achieved a nonsuccessful outcome. Twenty-three subjects (55%) were classified as having a successful outcome after the initial treatment, and 19 subjects (45%) were classified as having a successful outcome after 2 sessions. The mean number of days between visit 1 and visit 2 was 2.3 (SD=0.7) and 2.3 (SD=0.6) (P=.53) for the successful outcome and nonsuccessful outcome groups, respectively. The mean number of days between visit 1 and visit 3 was 6.3 (SD=1.2) and 6.2 (SD=1.2) (P=.99) for the successful outcome and nonsuccessful outcome groups respectively. Analysis of NPRS and NDI change scores revealed that the successful outcome group experienced significantly greater improvements (P<.001) in pain (NPRS change score=2.2, 95% CI=1.4 – 2.9) and disability (NDI change score=18.6%, 95% CI=13.3–25.0) over the nonsuccessful outcome group. The 10 potential predictor variables (Tab. 4) that exhibited a significance level of less than .10 were entered into the logistic regression. The cutoff values determined by the ROC curves were 11.5 for the FABQPA subscale, 9.5 for the FABQW subscale, 30 days since the onset of symptoms, and 30 degrees of cervical extension. In addition, the number of prior episodes of neck pain was dichotomized into <3 episodes or ≥3 episodes. Accuracy statistics for all 10 variables (and 95% CIs) are shown in Table 4. The positive LRs ranged from 1.1 to 6.4, with the strongest predictor being symptom duration of <30 days. Fourteen out of 15 subjects who were positive on at least 4 of the criteria and 32 of 37 subjects who were positive on at least 3 criteria were in the successful outcome group. 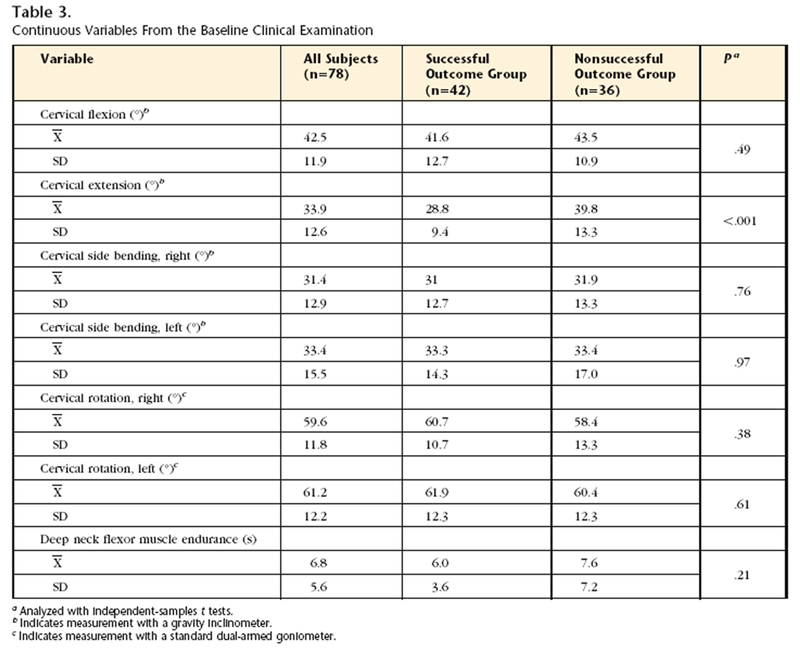 Of the 41 subjects with 2 or fewer variables, 31 were in the nonsuccessful outcome group (Table 5). Accuracy statistics were calculated for the numbers of variables present (Table 6). The pretest probability for the likelihood of success with thoracic spine thrust manipulation for this study was 54% (42 out of 78 subjects). If a subject exhibited 4 out of the 6 variables, the positive LR was 12.0 (95% CI=2.3–70.8) and the posttest probability of success increased to 93%. If a subject was positive on 3 out of the 6 variables, the positive LR was 5.5 (95% CI=2.7–12.0) and the posttest probability of success was 86%. If only 2 of the 6 variables were present, the positive LR decreased to 2.1 (95% CI=1.5–2.5) and the posttest probability of success was 71%. The analysis of the point-based system revealed a possible total of 10 points (for the 6 variables). The cutoff that maximized the diagnostic accuracy of the point-based system was 3.5 points. This resulted in a sensitivity of .83 (95% CI=.69 –.92), a specificity of .86 (95% CI=.71– .94), a positive LR of 5.9 (95% CI=2.6 –13.0), and a posttest probability of 87%. There was no significant difference in outcomes among therapists with varying levels of experience for either the percentage of successful outcomes or NDI change scores (P>.05). The group with 3 years of experience achieved a success rate of 16/30 (53%), and the group that had ≤3 years of experience demonstrated a success rate of 26/48 (54%). The NDI change scores were 12.8 (SD=15.7) for the group with ≤3 years of experience and 14.8 (SD=14.6) for the group with >3 years of experience. The LR is the statistic often used to determine the usefulness of a CPR. We selected to report the positive LR because the purpose of this study was to determine the change in probability that patients are likely to experience a successful outcome when they satisfy the criteria of the CPR. 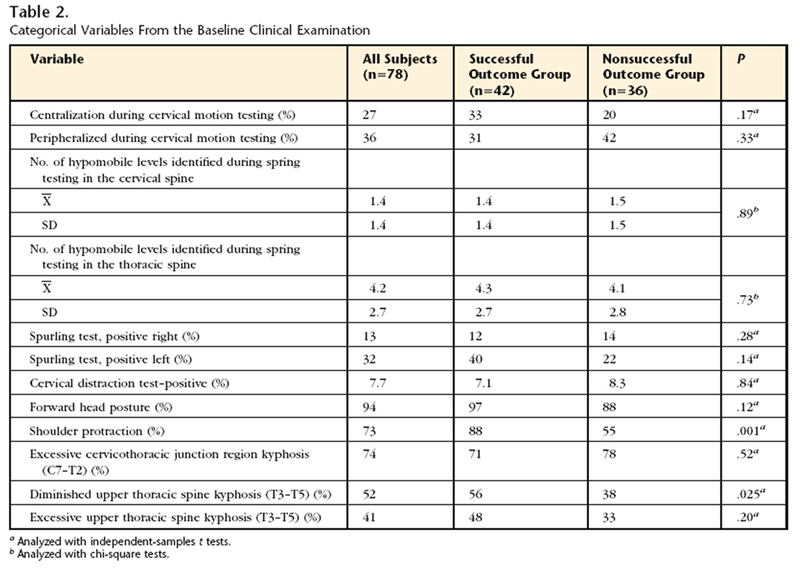 Based on the pretest probability in this study (54%) that a subject would respond positively to thoracic spine thrust manipulation, if the subjects exhibited 4 of the 6 criteria (positive LR=12), the posttest probability of success increased dramatically to 93%. However, based on the wide CI associated with positive findings on 4 out of 6 tests (95% CI=2.28–70.8), clinicians can have greater accuracy when determining the likelihood that a patient with neck pain will exhibit a rapid response to thoracic spine thrust manipulation when using 3 out of 6 variables (positive LR=5.5, 95% CI=2.72–12.0) to guide decision making (posttest probability=86%). The ability to a priori identify patients with neck pain who are likely to experience an early success with thoracic spine thrust manipulation while avoiding the potential risk associated with cervical spine thrust manipulation is useful for guiding clinical decision making for individual patients. The CPR also is useful for identifying patients with neck pain who should perhaps receive other forms of treatment rather than thoracic spine thrust manipulation. In our study, for example, if subjects exhibited only one of the variables, the positive LR was only 1.2, suggesting that the posttest probability of these subjects achieving a successful outcome is not much larger than chance, corresponding to a negligible increase of the posttest probability to 58% (Table 6). Six predictor variables were retained in the logistic regression analysis as maximizing the accuracy of predicting patients with neck pain who are likely to respond to thoracic spine thrust manipulation. Although the duration of the current episode was the strongest individual predictor, we used a higher threshold for defining success on the GROC than what has been recommended  to provide a greater degree of distinction between subjects who improved dramatically with manipulation and those who were improving over time simply due to natural history of the disorder. In addition, the magnitude of the difference in change scores for both the NPRS and NDI further substantiates that an important clinical change occurred in the group that was identified as having experienced a successful outcome. The duration of the current episode was identified as the strongest predictor in a CPR for identifying patients with LBP who are likely to experience a rapid and dramatic response to spinal manipulation (positive LR=4.39). The validation of the CPR also demonstrated that a shorter duration of symptoms was predictive for identifying patients who would respond to manipulation (positive LR=4.4). However, duration of symptoms was not predictive of the outcomes associated with the comparison group who received an exercise program (positive LR=1.0), suggesting that a shorter duration is predictive of response to manipulation and not the natural history of the disorder. Further validation studies are needed to determine whether this is also the case with the current CPR. The FABQ was a predictor variable for identifying patients with LBP who are likely to respond to either spinal manipulation (FABQW) [19, 20] or spinal stabilization (FABQPA). In contrast to patients with LBP who are likely to benefit from spinal stabilization who exhibited elevated FABQPA scores (>8),  our study identified lower FAPQPA scores (<12) as a predictor of a successful outcome. A correlation between disability and the FABQPA was identified by George et al  and Nederhand et al,  suggesting that fear-avoidance beliefs exhibit predictive validity in identifying patients with neck pain who may be at risk for chronic disability. Further research is necessary to clarify the role of fear-avoidance beliefs in patients with neck pain. One common flaw in the development of CPRs is that researchers often do not investigate the reliability of the measures used in their study and thus cannot determine whether predictor variables provide adequate reproducibility to be included in the rule. We investigated the reliability of potential predictor variables and, according to the descriptive criteria provided by Landis and Koch,  all variables in the CPR exhibited fair to substantial reliability. We consider these reliability coefficients acceptable to guide clinical decision making in the management of patients with neck pain. We successfully achieved the purpose of developing a CPR that identifies patients with neck pain who are likely to exhibit early success after thoracic spine thrust manipulation. However, this is only the first step in the process of developing and testing a CPR. Although no difference in outcomes occurred among clinicians with varying levels of experience, it should be recognized that data were collected at only one clinical site by 4 physical therapists. Future studies are necessary to validate our results and determine whether similar findings occur in a broader patient population with different treating clinicians. Additionally, a validation study should include a long-term follow-up and a comparison group to further investigate the predictive value of the variables in the CPR. If the rule is validated, an impact analysis of implementation of the rule on clinical practice patterns, outcomes, and costs of care should be investigated. Cote P, Cassidy J, Carroll L. The factors associated with neck pain and its related disability in the Saskatchewan population. Spine. 2000;25:1109–1117. Palmer KT, Walker-Bone K, Griffin MJ, et al. Prevalence and occupational associations of neck pain in the British population. Scand J Work Environ Health. 2001; 27:49 –56. Cote P, Cassidy JD, Carroll LJ, Kristman V. The annual incidence and course of neck pain in the general population: a population- based cohort study. Pain. 2004;112: 267–273. Wright A, Mayer T, Gatchel R. Outcomes of disabling cervical spine disorders in compensation injuries: a prospective comparison to tertiary rehabilitation response for chronic lumbar disorders. Spine. 1999; 24:178–183. Jette AM, Smith K, Haley SM, Davis KD. Physical therapy episodes of care for patients with low back pain. Phys Ther. 1994;74:101–110. Borghouts J, Janssen H, Koes B, et al. The management of chronic neck pain in general practice: a retrospective study. Scand J Prim Health Care. 1999;17:215–220. Haldeman S, Kohlbeck FJ, McGregor M. Unpredictability of cerebrovascular ischemia associated with cervical spine manipulation therapy: a review of sixty-four cases after cervical spine manipulation. Spine. 2002;27:49 –55. Di Fabio RP. Manipulation of the cervical spine: risks and benefits. Phys Ther. 1999; 79:50–65. Haldeman S, Kohlbeck FJ, McGregor M. Stroke, cerebral artery dissection, and cervical spine manipulation therapy. J Neurol. 2002;249:1098–1104. Cleland JA, Childs JD, McRae M, et al. Immediate effects of thoracic manipulation in patients with neck pain: a randomized clinical trial. Man Ther. 2005;10: 127–135. Norlander S, Nordgren B. Clinical symptoms related to musculoskeletal neckshoulder pain and mobility in the cervicothoracic spine. Scand J Rehabil Med. 1998;30:243–251. Adams G, Sim J. A survey of UK manual therapists’ practice of and attitudes towards manipulation and its complications. Physiother Res Int. 1998;3: 206–227. Fernandez-de-las-Penas C, Fernandez-Carnero J, Fernandez AP, et al. Dorsal manipulation in whiplash injury treatment: a randomized controlled trial. Journal of Whiplash and Related Disorders. 2004;3: 55–72. Savolainen A, Ahlberg J, Nummila H, Nissinen M. Active or passive treatment for neck-shoulder pain in occupational health care? A randomized controlled trial. Occup Med (Lond). 2004;54:422–424. Leboeuf-Yde C, Lauritsen JM, Lauritzen T. Why has the search for causes of low back pain largely been nonconclusive? Spine. 1997;22:877–881. Petren-Mallmin M, Linder J. MRI cervical spine findings in asymptomatic fighter pilots. Aviat Space Environ Med. 1999;70: 1183–1188. Rose S. Physical therapy diagnosis: role and function. Phys Ther. 1989;69: 535–537. Hicks GE, Fritz JM, Delitto A, McGill SM. Preliminary development of a clinical prediction rule for determining which patients with low back pain will respond to a stabilization exercise program. Arch Phys Med Rehabil. 2005;86:1753–1762. Flynn T, Fritz J, Whitman J, et al. A clinical prediction rule for classifying patients with low back pain who demonstrate short term improvement with spinal manipulation. Spine. 2002;27:2835–2843. Childs JD, Fritz JM, Flynn TW, et al. A clinical prediction rule to identify patients likely to benefit from spinal manipulation: a validation study. Ann Intern Med. 2004; 141:920–928. Childs JD, Fritz JM, Piva SR, Whitman JM. Proposal of a classification system for patients with neck pain. J Orthop Sports Phys Ther. 2004;34:686–696. Werneke M, Hart DL, Cook D. A descriptive study of the centralization phenomenon: a prospective analysis. Spine. 1999; 24:676–683. Jensen MP, Turner JA, Romano JM. What is the maximum number of levels needed in pain intensity measurement? Pain. 1994;58:387–392. Vernon H, Mior S. The Neck Disability Index: a study of reliability and validity. J Manipulative Physiol Ther. 1991;14: 409–415. Waddell G, Newton M, Henderson I, et al. Fear-Avoidance Beliefs Questionnaire and the role of fear-avoidance beliefs in chronic low back pain and disability. Pain. 1993;52:157–168. Jacob T, Baras M, Zeev A, Epstein L. Low back pain: reliability of a set of pain measurement tools. Arch Phys Med Rehabil. 2001;82:735–742. George S, Fritz J, Erhard E. A comparison of fear-avoidance beliefs in patients with lumbar spine pain and cervical spine pain. Spine. 2001;26:2139–2145. Flynn TW, Whitman J, Magel J. Orthopaedic Manual Physical Therapy Management of the Cervical-Thoracic Spine and Ribcage. San Antonio, Tex: Manipulations Inc; 2000. Kendall FP, McCreary EK, Provance PG. Muscles: Testing and Function. 4th ed. Baltimore, Md: Williams & Wilkins; 1993. Griegel-Morris P, Larson K, Mueller-Klaus K, Oatis CA. Incidence of common postural abnormalities in the cervical, shoulder, and thoracic regions and their association with pain in two age groups of healthy subjects. Phys Ther. 1992;72: 425–431. McKenzie RA. Cervical and Thoracic Spine: Mechanical Diagnosis and Therapy. Minneapolis, Minn: Orthopaedic Physical Therapy Products; 1990. Harris KD, Heer DM, Roy TC, et al. Reliability of a measurement of neck flexor muscle endurance. Phys Ther. 2005;85: 1349–1355. Maitland G, Hengeveld E, Banks K, English K. Maitland’s Vertebral Manipulation. 6th ed. Oxford, United Kingdom: Butterworth- Heinemann; 2000. Spurling RG, Scoville WB. Lateral rupture of the cervical intervertebral discs: a common cause of shoulder and arm pain. Surg Gynecol Obstet. 1944;78:350–358. Magee D. Orthopedic Physical Assessment. 4th ed. Philadelphia, Pa: Saunders; 2002. Wainner R, Fritz J, Irrgang J, et al. 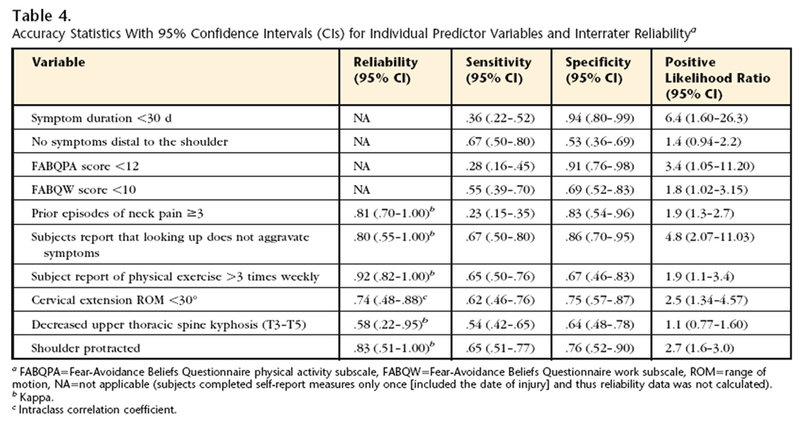 Reliability and diagnostic accuracy of the clinical examination and patient self-report measures for cervical radiculopathy. Spine. 2003;28:52–62. Elvey RL. The investigation of arm pain: signs of adverse responses to the physical examination of the brachial plexus and related tissues. In: Boyling JD, Palastanga N, eds. Grieve’s Modern Manual Therapy. New York, NY: Churchill Livingstone Inc; 1994:577–585. Jaeschke R, Guyatt GH, Sackett DL. Users’ guides to the medical literature, III: how to use an article about a diagnostic test, B. What are the results and will they help me in caring for my patients? The Evidence- Based Medicine Working Group. JAMA. 1994;271:703–707. Erhard RE. The Spinal Exercise Handbook: A Home Exercise Manual for a Managed Care Environment. Pittsburgh, Pa: Laurel Concepts; 1998. Jaeschke R, Singer J, Guyatt G. Measurement of health status: ascertaining the minimal clinically important difference. Controlled Clin Trials. 1989;10:407–415. Koes BW, Bouter LM, van Mameren H, et al. The effectiveness of manual therapy, physiotherapy, and treatment by the general practitioner for nonspecific back and neck complaints: a randomized clinical trial. Spine. 1992;17:28 –35. Koes BW, Bouter LM, van Mameren H, et al. Randomised clinical trial of manipulative therapy and physiotherapy for persistent back and neck complaints: results of one-year follow-up. BMJ. 1992;304: 601–605. Farrar J, Young JJ, La Moreaux L, et al. Clinical importance of changes in chronic pain intensity measured on an 11-pont numerical pain rating scale. Pain. 2001; 94:149–158. Hurst H, Bolton J. Assessing the clinical significance of change scores recorded on subjective outcome measures. J Manipulative Physiol Ther. 2004;27: 26–35. Bolton JE. Sensitivity and specificity of outcome measures in patients with neck pain: detecting clinically significant improvement. Spine. 2004;29: 2410–2417. Hoving JL, Koes BW, de Vet HC, et al. Manual therapy, physical therapy, or continued care by a general practitioner for patients with neck pain: a randomized, controlled trial. Ann Intern Med. 2002; 136:713–722. Freedman DA. A note on screening regression equations. The American Statistician. 1983;37:152–155. Deyo RA, Centor RM. Assessing the responsiveness of functional scales to clinical change: an analogy to diagnostic test performance. J Chronic Dis. 1986;39: 897–906. Concato J, Feinstein AR, Holford TR. The risk of determining risk with multivariable models. Ann Intern Med. 1993;118: 201–210. Cohen J. A coefficient of agreement for nominal scales. Educ Psychol Meas. 1960; 20:37–46. Cohen J. Weighted kappa: nominal scale agreement with provision for scaled disagreement or partial credit. Psychol Bull. 1968;70:213–220. Shrout PE, Fleiss JL. Intraclass correlations: uses in assessing rater reliability. Psychol Bull. 1979;86:420–426. Cleland JA, Childs JD, Fritz JM, Whitman JM. Inter-rater reliability of the historical and physical examination in patients with mechanical neck pain. Arch Phys Med Rehabil. 2006;87:1388–1395. Kuijpers T, van der Windt DA, Boeke AJ, et al. Clinical prediction rules for the prognosis of shoulder pain in general practice. Pain. 2006;120:276–285. Lee SJ, Lindquist K, Segal MR, Covinsky KE. Development and validation of a prognostic index for 4-year mortality in older adults. JAMA. 2006;295:801–808. Redelmeier DA, Lustig AJ. Prognostic indices in clinical practice. JAMA. 2001;285: 3024–3025. Nederhand MJ, Ijzerman MJ, Hermens HJ, et al. Predictive value of fear avoidance in developing chronic neck pain disability: consequences for clinical decision making. Arch Phys Med Rehabil. 2004;85: 496–501. Laupacis A, Sekar N, Stiell IG. Clinical prediction rules: a review and suggested modifications and methodological standards. JAMA. 1997;277:488–494. Landis JR, Koch CG. The measurement of observer agreement for categorical data. Biometrics. 1977;33:159–174. Norlander S, Aste-Norlander U, Nordgren B, Sahlstedt B. Mobility in the cervicothoracic motion segment: an indicative factor of musculo-skeletal neck-shoulder pain. Scand J Rehabil Med. 1996;28: 183–192. Norlander S, Gustavsson BA, Lindell J, Nordgren B. Reduced mobility in the cervico- thoracic motion segment—a risk factor for musculoskeletal neck-shoulder pain: a two-year prospective follow-up study. Scand J Rehabil Med. 1997;29: 167–174. Greenman P. Principles of Manual Medicine. 2nd ed. Philadelphia, Pa: Lippincott Williams & Wilkins; 1996. Johansson H, Sojka P. Pathophysiological mechanisms involved in genesis and spread of muscular tension in occupational muscle pain and in chronic musculoskeletal pain syndromes: a hypothesis. Med Hypotheses. 1991;35:196–203. Knutson GA. Significant changes in systolic blood pressure post vectored upper cervical adjustment vs resting control groups: a possible effect of the cervicosympathetic and/or pressor reflex. J Manipulative Physiol Ther. 2001;24: 101–109. Wainner R, Gill H. Diagnosis and nonoperative management of cervical radiculopathy. J Orthop Sports Phys Ther. 2000;12: 728–744. Daffner S, Hilibrand A, Hanscom B, et al. Impact of neck and arm pain on overall health status. Spine. 2003;2817:2035. Borghouts JA, Koes BW, Bouter LM. 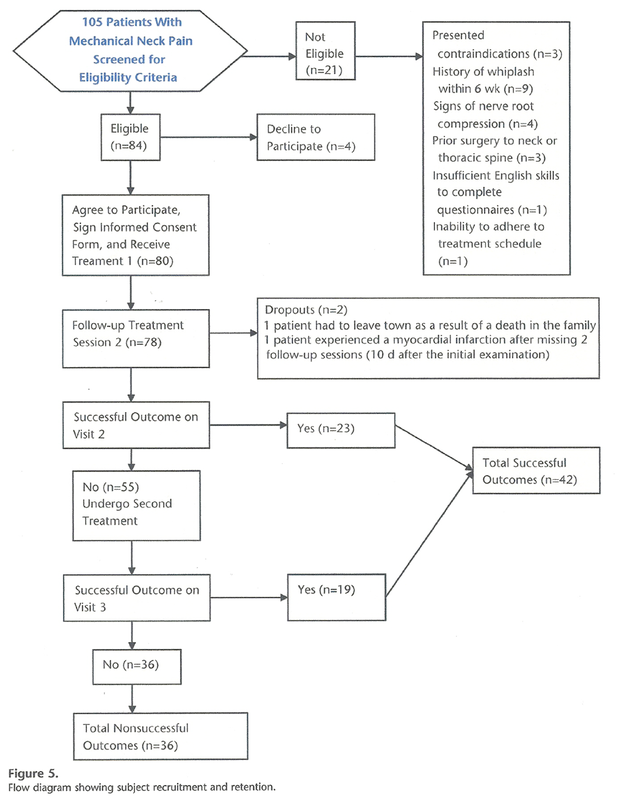 The clinical course and prognostic factors of non-specific neck pain: a systematic review. Pain. 1998;77:1–13. McGinn T, Guyatt G, Wyer P, et al. Users’ guides to the medical literature, XXII: how to use articles about clinical decision rules. JAMA. 2000;284:79–84.